Vice President Yemi Osinbajo has replied former Vice President Atiku Abubakar’s noting that his concept of restructuring is vague. Osinbajo in his response also criticised Atiku noting that he failed to address the issue of corruption. The Vice President added some Nigerians in authority used political positions or to either loot the treasury or get favourable concessions to enrich themselves. 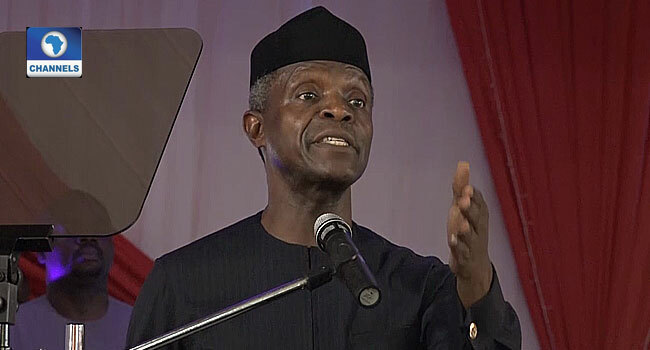 Osinbajo’s reaction comes three days after Atiku accused him of failing to appreciate the connection between Nigeria’s defective structure and its underperformance. In a statement on September 1, Atiku claimed that Nigeria has operated a faulty system of federalism, especially under military governments. He noted that the economic and political structures of Nigeria were defective. This, according to him, has resulted in weak economic management systems as well as prevented all levels of government – federal, states and local – from operating at optimal levels. Osinbajo in his response to this said he believes that restructuring in whatever shape or form, will not mean much if our political leaders see public resources as an extension of their bank accounts. Kindly permit me a response to a piece in your publication, titled “Osinbajo got it wrong on Restructuring,” written, we are told, by my illustrious predecessor in office, Alhaji Atiku Abubakar. First, let me say that I really would have expected Alhaji Abubakar to at least get the full text of my comments before his public refutal of my views. But I understand; we are in that season where everything is seen as fair game! He quoted me as saying that “the problem with our country is not a matter of restructuring… and we must not allow ourselves to be drawn into the argument that our problems stem from some geographic re-structuring”. As the quote shows, I rejected the notion that geographical restructuring was a solution to our national problems. Geographical restructuring is either taking us back to regional governments or increasing the number of States that make up the Nigerian federation. As we all may recall, the 2014 National Conference actually recommended the creation of 18 more States. And I argued that, with several States struggling or unable to pay salaries, any further tinkering with our geographical structure would not benefit us. We should rather ask ourselves why the States are underperforming, revenue and development wise. I gave the example of the Western Region (comprising even more than what is now known as the South West Zone), where, without oil money, and using capitation tax and revenues from agriculture and mining, the government funded free education for over 800,000 pupils in 1955, built several roads, farm settlements, industrial estates, the first TV station in Africa, and the tallest building in Nigeria, while still giving up fifty percent of its earnings from mining and minerals for allocation to the Federal Government and other regions. I then argued that what we required now was not geographical restructuring but good governance, honest management of public resources, deeper fiscal Federalism, and a clear vision for development. On the issue of deeper fiscal Federalism or restructuring, I explained how the then Lagos State Government, led by Asiwaju Bola Ahmed Tinubu, decided to fight for greater autonomy of States. As Attorney-General at the time, it was my duty and privilege to lead the legal team against the then Federal government, in our arguments at the Supreme Court. I am sure that Alhaji Atiku Abubakar would remember these cases on greater autonomy for States that I cite below, as he was Vice President of the Federal Republic of Nigeria at the time. At the Supreme Court, we won several landmark decisions on restructuring Nigeria through deeper fiscal federalism, some of which are late converts to the concept, now wish to score political points on. It was our counter-claims alongside those of other littoral States, that first addressed so comprehensively the issue of resource control. We agreed with the oil-producing States that they had a right to control their resources. We argued, though unsuccessfully, that the Ports of Lagos were also a resource, which should enable Lagos State, in the worst case, to be paid the derivation percentage for proceeds of its natural resources. Years later, we also filed an action at the Supreme Court arguing that the Value Added Tax, being a consumption tax, should exclusively belong to the States. On the issue of who, between the Federal and State governments, should have authority to grant building permits and other development control permits, the Supreme Court, by a slim majority, ruled in our favour. It held that, even with respect to federal land, States had exclusive authority to grant building or other developments control permits. In 2004, we created 37 new local governments in Lagos State. We believed that we had a Constitutional right to do so and that in any event, a State should have a right to create its own administrative units. Several other States joined us and created theirs. The Federal government’s response was to seize the funds meant for our local governments, thus strangulating States like Lagos, which had created new local governments. We challenged this at the Supreme Court. The court held that the President had no right under the Constitution to withhold or seize funds meant for the States. The allocations were not a gift of the Federal Government to the States. They were the Constitutional right of the States and local governments. The court also agreed that States had a Constitutional right to create local governments, pursuant to section 8 of the Constitution, but that the creation remained inchoate until the National Assembly, by resolution, amended the existing list of local governments to capture the newly created LGs. In response, we created by State Law, Local Council Development Areas (LCDAs), to accommodate the newly created Local Government Councils until such a time as the National Assembly would complete the process. But the Lagos State Government took up the challenge to re-engineer its revenue service, making it autonomous. With innovative management, tax collection in Lagos became more efficient, and tax revenues continued to grow geometrically. Today, the State earns more IGR than 30 States of Nigeria put together! Further, we contested the attempts of the then Federal Government to create supervisory authority over the Finances of Local Governments by the signing into law of the Monitoring of Revenue Allocation to Local Governments Act, 2005. The Supreme Court also ruled in our favour, striking down many provisions of the law that sought to give the Federal government control over local government funding. I have been an advocate, both in court and outside, of fiscal Federalism and stronger State Governments. I have argued in favour of the State Police, for the simple reason that policing is a local function. You simply cannot effectively police Nigeria from Abuja. Only recently, in my speech at the Anniversary of the Lagos State House of Assembly, I made the point that stronger, more autonomous States would more efficiently eradicate poverty. So I do not believe that geographical restructuring is an answer to Nigeria’s socio-economic circumstances. That would only result in greater administrative costs. But there can be no doubt that we need deeper fiscal Federalism and good governance. Alhaji Atiku’s concept of restructuring is understandably vague because he seeks to cover every aspect of human existence in that definition. He says it means a “cultural revolution”. Of course, he does not bother to unravel this concept. He says we need a structure that gives everyone an opportunity to work, a private sector driven economy. Yes, I agree. These are critical pillars of our Economic Recovery and Growth Plan (ERGP), including our Ease of Doing Business Programme. If, however, this is what he describes as restructuring, then it is clear that he has mixed up all the issues of good governance and diversification of the economy with the argument on restructuring. Good governance involves, inter alia, transparency and prudence in public finance. It involves social justice, investing in the poor, and jobs for young people; which explains our School Feeding Programme, providing a meal a day to over 9 million public school children in 25 States as of today. Our NPower is now employing 500,000 graduates; our TraderMoni that will be giving microcredit to 2 million petty traders; our Conditional Cash Transfers giving monthly grants to over 400,000 of the poorest in Nigeria. The plan is to cover a million households. Surprisingly, Alhaji Atiku leaves out the elephant in the room – corruption. And how grand corruption, fueled by a rentier economic structure that benefits those who can use political positions or access to either loot the treasury or get favourable concessions to enrich themselves. This was the main part of my presentations the Minnesota Town Hall meeting. In arguing for good governance, I made the point that our greatest problem was corruption. I pointed out that grand corruption, namely the unbelievable looting of the treasury by simply making huge cash withdrawals in local and foreign currency, was the first travesty that President Buhari stopped. I showed the OPEC figures from oil revenues since 1990. In four years from 2010 to 2014, the PDP government earned the highest oil revenues in Nigeria’s history, USD381.9billion. By contrast, the Buhari Administration has earned USD121 billion from May 2015 to June 2018, less than 1/3 of what Jonathan Administration earned at the same period in that administration’s life. Despite earning so much less, we are still able to invest more in infrastructure than any government in Nigeria’s history. The difference is good governance and fiscal prudence. In the final analysis, restructuring in whatever shape or form, will not mean much if our political leaders see public resources as an extension of their bank accounts. This, I believe, is the real issue.